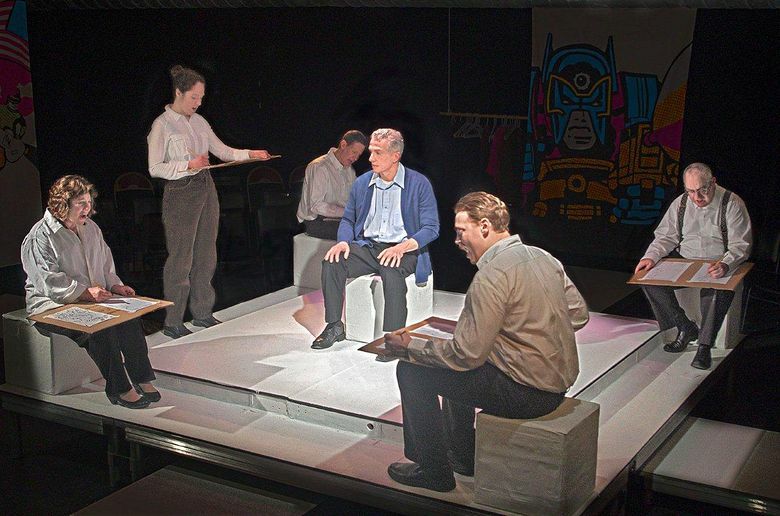 Rick Espaillat, center, as Jack Kirby, and the ensemble in “King Kirby,” being staged by Ghostlight Theatricals. A portrait of Jack Kirby, one of the most influential artists in the history of comic books, “King Kirby” runs through Jan. 23 at Ballard Underground. If you ever take in a movie, or covet memorabilia or a vintage comic book featuring The Incredible Hulk, Iron Man or Captain America, give a silent thanks to Jack Kirby. A skilled graphic artist with a fantastical imagination, Kirby first drew those and many other cartoon superheroes for Marvel Comics and other major purveyors of action fantasias. He eventually received recognition for his influential artistry, but only a fraction of the royalties and credit owed to him given his role in American pop culture. It’s all laid out in “King Kirby,” an engrossing bio-play by Fred Van Lente and Crystal Skillman that’s receiving a dynamic staging from Ghost Light Theatricals. On now at Ballard Underground, the production is served well in the compact basement venue thanks to Rob Raas-Bergquist’s four-point, in-the-round staging and a vigorously engaged cast. By Fred Van Lente and Crystal Skillman. Through Jan. 23 at Ballard Underground, 2220 N.W. Market St., Seattle; $12-$15 (206-395-5458 or ghostlighttheatricals.org). Four ramps spoking out from center stage, and outsized silk-screen prints of famous comic-book champions, define Brandon Estrella’s crafty scenic design. The set allows the role-switching cast smooth access as they exit and reappear in a variety of guises and eras. It’s a familiar story: By the time a trusting Kirby realized he was being cheated, it was impossible to recover the royalties he deserved. Kirby attains some measure of heroism here as he sticks to his decency and principles in a ruthless industry (also the subject of another play, Book-It Rep’s recent “The Amazing Adventures of Kavalier & Clay”). And speaking of credit, a good portion here should go to Espaillat, a versatile TV and film actor tackling his first major Seattle stage role. Whether bitterly angry or crotchety, sweetly infatuated with the encouraging gal he marries or dodging bullets while hunting down Nazis in Europe, Espaillat never flags at conveying Kirby’s angry aliveness, and his relentless creativity.